It’s Saint Patrick’s Day! 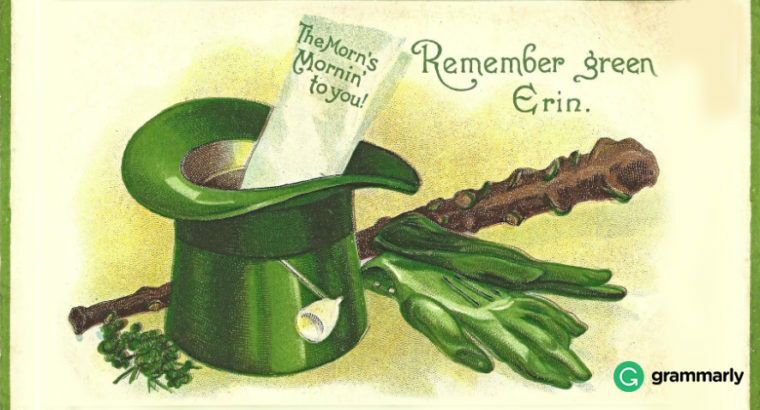 Walk into any department or grocery store at this time of year, and you may find yourself surrounded by leprechaun hats, green shirts, rainbow banners, shamrock-shaped candy, and other Irish-themed paraphernalia. Embedded in these symbols of Irish tradition is the idea of luck (good, bad, and uncertain) and the language associated with luck. Meaning: to achieve sudden or sensational success. Example: The hungry wolf thought he had hit the jackpot when he discovered a herd of sleeping sheep. Meaning: a source of something desirable (e.g., wealth, information). Example: Facebook and Twitter provide a goldmine of personal status updates. Meaning: a consoling aspect of a difficult situation. Example: The silver lining to losing my phone is that I no longer have to answer when my boss calls. Meaning: a redeeming feature that compensates for other negative qualities. Example: Senior discounts are the saving grace of old age. Example: I lucked out in my art history class by having a photographic memory and consistent study habits. Meaning: to feel grateful for avoiding a bad situation. Example: I thank my lucky stars that I bought an umbrella right before the thunderstorm. Meaning: to be ungrateful for a favor. Example: When I complained about the size of my weekly allowance, my dad told me that I shouldn’t look a gift horse in the mouth. Meaning: to rely on a desirable result before it happens. Example: You may have a large salary soon, but don’t count your chickens before they hatch. Meaning: a phrase that expresses the hope that (1) something desirable will happen or continue to happen, or (2) something undesirable will not happen. (1) I have done well on my math tests this year. Knock on wood! (2) Nobody in my family has had the flu this year. Knock on wood! Meaning: little or no possibility of success. Example: John hates exercise—a fat chance he has of winning the swim competition! Meaning: the opportunity has passed. Example: I wanted to be a famous child actor, but when I turned thirty and had not starred in any movies, I realized that that ship had sailed. Meaning: a difficult situation or period. Example: Jim is going through a rough patch right now because he lost his job and his girlfriend dumped him.